In fact, it takes 350 to 570 caterpillars every day for sixteen days for a pair of chickadees to raise a family, according to Tellemy! And it’s native plants that provide this kind of food source, while most non-natives do not. 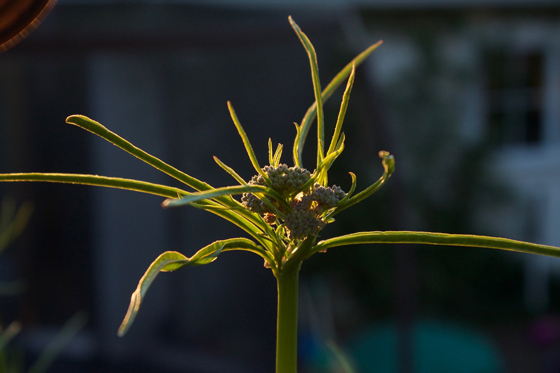 Wondering what plants you can incorporate into your own garden to attract birds? Check out the Audubon’s Society’s terrific new Native Plant Database at https://www.audubon.org/plantsforbirds. 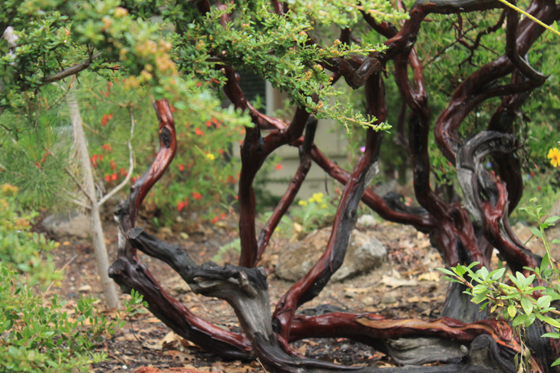 Another excellent database is the Califorinia Native Plant Society’s CalScape (https://calscape.org/), which will provide you with information on all of the native trees, shrubs, perennials, annuals, grasses, succulents, vines and ferns that grow naturally in your area. 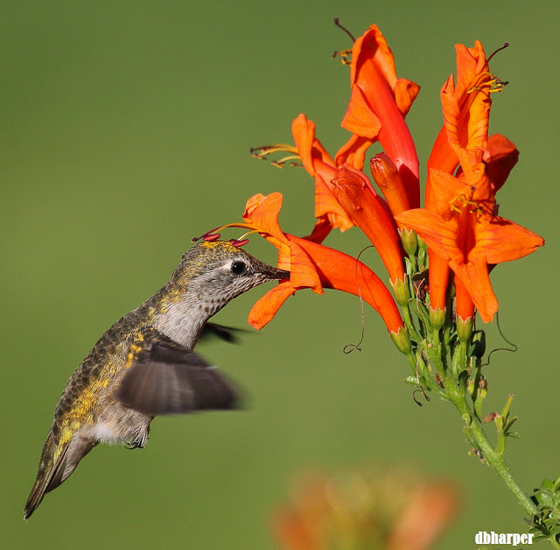 In either database, just enter your zip code to obtain a list of bird-friendly plants that will attract the birds you love while making your space beautiful, easy to care for, and better for the environment. Here in the Bay Area, we have an outstanding resource for people who want to create bird-friendly gardens—the annual Bringing Back the Natives Garden Tour. Coming up on Sunday, May 5th, 2019, the 15th Annual Tour will showcase thirty seven East Bay gardens that have excelled at attracting birds. 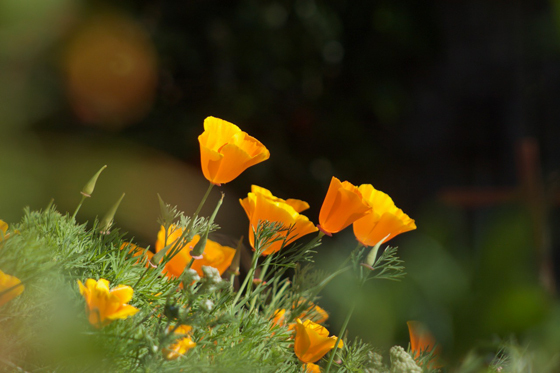 This award-winning, self-guided tour features beautiful Alameda and Contra Costa County gardens that are pesticide-free, water-conserving, provide habitat for wildlife, and contain sixty percent or more native plants. Registration for the Fifteenth Annual Bringing Back the Natives Garden Tour, which will take place on Sunday, May 5, 2019 from 10:00 to 5:00, is now open. This award-winning event features thirty seven Alameda and Contra Costa county gardens. The self-drive tour showcases a variety of gardens, from large wooded lots in the hills to small parcels in the flats. Native plants will be available for sale, and forty talks will be offered on the week-end of the event. Pre-registration for the Tour is required. Register early to ensure a place. Below are links to descriptions of some of the gardens that have been particularly successful at attracting birds and will be featured on the Bringing Back the Natives tour on May 5th. You will also find a tip from each host for attracting our winged friends. Each of these gardens has a talk scheduled on the day of the tour; the talk times are listed after the gardener’s tip. Inspired by the Tour, Sallie decided that gardening for wildlife was the way to go. Out went two tons of concrete and two more tons of railroad ties, along with the non-natives that had fared poorly in the drought, and in came more than a hundred species of native plants, chosen from lists of plants that attract birds, bees, and butterflies created by past host Mardi Mertens. Birds seen in Sallie’s garden. Tip: Include a diversity of plant heights, from trees to shrubs, groundcovers, and vines to provide food, shelter, and nesting areas. A dead tree has been left for woodpeckers and other birds to nest in. Two brush piles (located on the edge of the garden) provide additional shelter for birds. The water in a raised bird bath attracts birds, as do brush piles, bird houses, fruit, nuts, berries and insects, which provide shelter and food for more than fifty species of birds. Birds that nest in the garden include Anna’s and Allen’s hummingbirds, Bewick’s wrens, bushtits, California towhees, lesser goldfinches, northern flickers, mockingbirds, Nuttall’s woodpeckers, purple finches, spotted towhees, scrub jays, and wrentits. In addition to birds, the succession of flowering plants attracts native bees, and many species of butterflies, including the beautiful pipevine swallowtail butterfly is a common sight, both fluttering through the garden and caterpillaring about in a large patch of Dutchman’s pipevine. Tip: Provide water and a wide variety of nesting sites, cover, and feeding options. Al has used specific plants (such as Toyon), water features, bird houses, and supplemental food to attract birds to his yard. After forty five years of gardening with native plants, Al now believes that the overall design of the plantings may be the most important element. A design that provides a wide variety of nesting sites, cover, and feeding options has the potential for bringing in the most species. Such a design might include everything from tall trees to small plants and from dense shrubbery to open ground. To provide this, in his own garden Al has developed a backyard concept of an oak/pine woodland with some areas of open space. Bird baths and feeders, nesting houses, a shallow stream riffle, brush piles, dust bath areas, and abundant plant cover have attracted over ninety species of birds, including thrashers, tanagers, and Black-throated Gray Warblers. 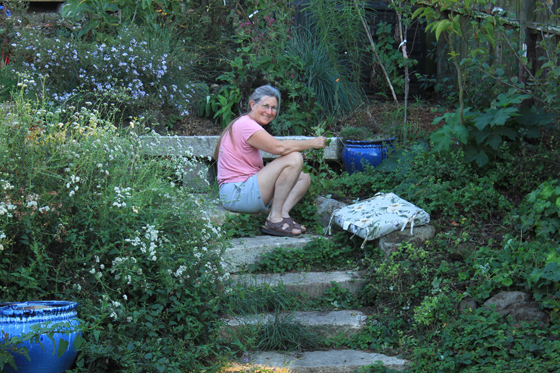 Upon purchasing her home Stefanie converted the large lawn into a garden containing more than one hundred species of native plants and edibles. The natives provide berries, seeds, nuts, nectar, pollen, nesting areas, and shelter for the sixteen species of birds Stefanie has seen in her wildlife-friendly garden. Cedar waxwings, chestnut-backed chickadees, and finches visit the garden. Cooper’s hawks soar overhead. 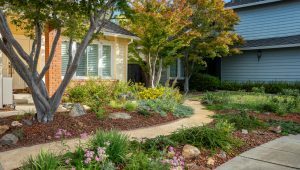 Come and learn how to replace your lawn with natives, and get paid to do it! Tour the school’s native plant garden, browse the more than seventy species of native trees, shrubs, perennials, vines and wildflowers that were grown by the students that will be available for sale, and buy a delicious lunch and enjoy it in the garden! Tip: The native plants were placed to provide habitat and protection at different heights and levels. The natives also provide food year-round for for birds year-round, in the form of berries, nectar, seeds, and insects. Pedestal bowls provide water, and help to keep birds safe from cats. Through the Tour homeowner Gretchen Pivonka found Lois Simonds of Gardening by Nature’s Design, who sheetmulched away the lawn and designed and installed this peaceful and serene garden, which was created to attract birds. In addition to feathered visitors, skippers delight in chasing each other through the white sage; anise swallowtail butterflies flutter more gracefully through the garden. Bees buzz the sages. The Fifteenth annual Bringing Back the Natives Garden Tour takes place on Sunday, May 5, from 10 a.m. until 5 p.m. Advance registration and the purchase of one $10 garden guide for your group is required; donations are requested. Artwork will be available for sale, and music will be performed at a number of gardens. Register at bringingbackthenatives.net. Volunteers are needed. 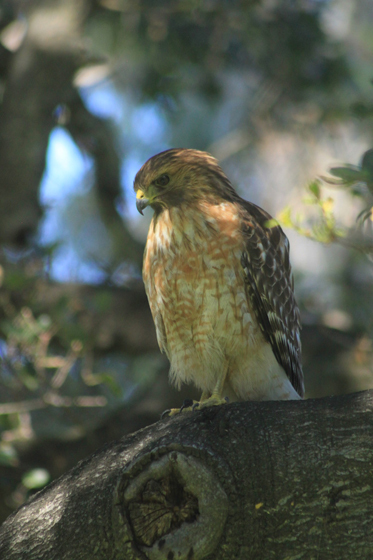 Kathy Kramer has seen thirty species of birds in her native plant garden in San Pablo. Kathy Kramer, a Golden Gate Audubon Society member, is the founder of the Bringing Back the Natives garden tour.